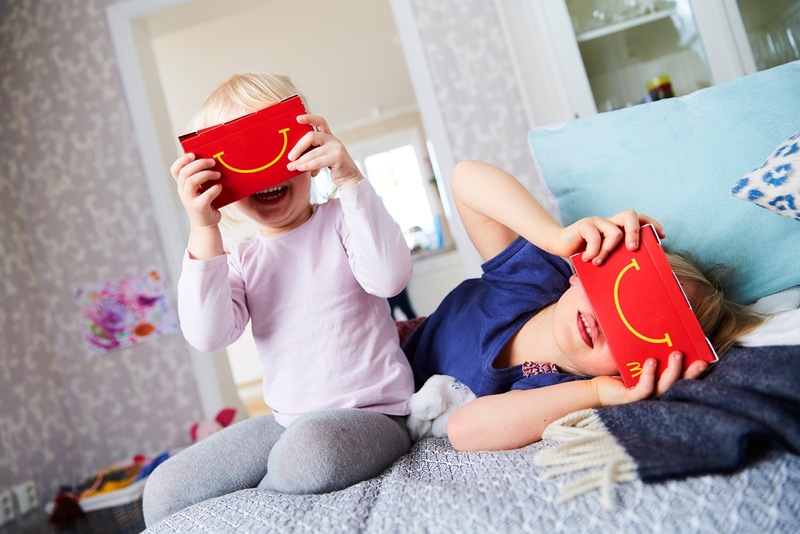 NEWS: Swedish Happy Meals turn into VR Goggles! Virtual Reality never smelt so burger-y. If you needed yet another reason for why Scandinavia is the greatest place on earth, during the first two weekends of March, Swedish McDonald's outlets will be offering Happy Meal boxes that transform into Google Cardboard-style VR headsets. Kids will be able to nosh back the grub (is it just us, or is it hard to imagine a Swedish child eating a Big Mac? ), then fold the Happy Meal box up, insert a special lens box which is included, then slide in a smartphone running a VR app. It might sound a bit unimpressive, but considering kids will be able to get all this for the equivalent of less than a fiver (and the "food", we suppose) makes it a great way into the world of VR for them. Compare that to the price of the likes of the Homido VR Headset, and even the cheaper Archos set, and we feel we have to take our hats off to Micky Dee's. Swedish parents, prepare to have you phone pinched by greasy fingers.